Hey there! Thanks for dropping by Dave Harms's Blog! Take a look around and grab the RSS feed to stay updated. See you around! Text messaging has enabled students another method of cheating. Students can take a picture of an exam and send it in a matter of seconds. Someone can view the picture and text back the answers. The cheating student can either ask to go to the bathroom to get the answers or try and look down at the screen. Another method is to Google it. If you text Google a question, Google will text back the answer within a few seconds (Google, 2010, ¶ 1). Examples include math problems and definitions. This relatively new technology (within the last 5000 days) is related to ancient forms of cheating. Older methods of cheating included writing answers on arms, shoes, cheat sheets, visors of hats, or simply on the desk. All of these methods are still in use, but the technology of text messaging makes it even easier to get away with it. 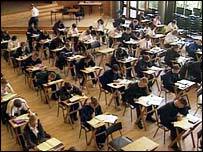 The BBC (2005) reported that 287 students were caught cheating using text messaging. Umarji (2005) reported that many students were text message cheating on every test they took. Snyder (2009) revealed that there are tutorials on YouTube that teach students how to cheat in the digital age including replicating a soda label to include answers as ingredients. Kelly (2007) discussed three predictions for the future; embodiment, restructuring, and codependency. When students text message Google for the answer it is essentially giving the Internet a body to travel outside the Internet. Student thought process on the value of memorizing facts has been restructured using texting. And students are already codependent on technology for getting answers.